Designers and architects make millions of decisions on products when it comes to designing new buildings or during major renovations. Many times, the decisions involve tradeoffs when balancing all the influencers’ needs. Do you put in a product that achieves the look you want? Should you select the product that best meets the building owner’s budget? How many “or equals” should you have? Some choices are viewed as more critical than others. In the end, however, the balance between performance-based or cost-based has to be measured. This is especially true of “systems” such as the HVAC systems or a lighting package or other categories of specification. Moreover, there are still other decisions that become critical because of the functionality of the products being specified (i.e., elevators), or those that require adhering to building codes and safety concerns. Knowing where a product and a brand falls in the specification process – as well as in the answers to these questions — is essential to helping manufacturers understand how they can assist designers achieve their ultimate vision or goals for a project. In other words, a knowledge of how brand awareness is created and maintained can put the odds in favor of a manufacturer who is trying to influence the design decision. The comprehensive Accountability (AIM) Architects’ Brand Preference Study conducted several years ago revealed the competitive nature of textile wall coverings in terms of such decisions. This category was especially competitive from the designer’s perspective, making it difficult for a manufacturer to maneuver in the process of specification. There were over 25 brands or companies mentioned by those that were “involved” with the specification of these products. This was a “blind” brand preference study; that is, no brands were mentioned, but architects and designers were invited to “write in” what was on their minds for the category. Although specific brands often shift over time, the mindset regarding decisions holds true: there seems to be many factors that manufacturers need to consider when analyzing where they stand in the market, especially in relation to designers’ perception of their brands. The most important factor is to understand more about an architect’s level of involvement when specifying particular products. Sometimes, for example, a manufacturer thinks it is impossible for an architect or designer NOT to be involved with their products. As our study demonstrated in many categories, that’s not always the case: often, the designer/architect will delegate that specification to another professional! Wall finishes is such a category. Looking at wall finishes, the degree to which architects are involved in specifying a specific brand or manufacturer varies by the type of project or location within the facility. For example, in a hotel or high-end office building there may be an interior designer who controls the design and brand of wall finish. In fact, in AIM’s Architect’s Brand Preference,33% of the architects surveyed indicated that they were not involved in selecting and specifying the brand of textile wall finishes. In addition, 37% indicated they did not have any type of brand preference. While architects may indicate they have “no preference,” they are, in fact, involved in specifying and recommending wall finishes. However, delegate the brand selection to the interior designer or “others” in the specification path. And, when asked, the interior designer would say they are heavily involved in that specification! Some firms also may defer to a list of “approved” brands that meet their performance requirements. In other words, they “wash their hands” of involvement! This “push off” is significant enough to take notice. What should textile wall finish manufacturers do to enhance brand selection and preference, perhaps forcing the issue with the designer and architect? How can manufacturers convert “no preference” answers into solid specifications and recommendations for their brands? To answer these questions, consider what we know about specifications. The key to gaining ground in specifications is to become part of the “basis of design.” This means that the architect or designer is calling out a specific brand that is used to meet the objectives of the project. To learn more about how often “basis of design” is used in textile wall finish specs, AIM used ConstructConnect™, (https://www.constructconnect.com/), an online construction database, to get a better sense of how textile wall finishes are specified. By searching the project specifications for “textile wall finish or wall covering projects with Basis of Design,” in specific years, we saw how the specification for “basis of design” and specific brands has changed. 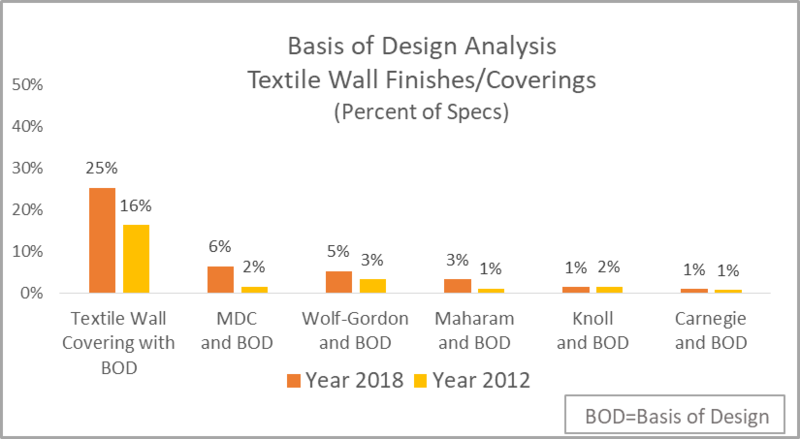 Interestingly, only 25% of projects in 2018 had a textile wall finish project that also included a brand as the “basis of design.” This reflects AIM’s prior research suggesting that it is delegated. However, even if delegated, it can STILL become a basis of design if pushed hard enough! AIM noticed, too that the percentage has increased since 2012 where “basis of design” in textile wall finish or wall covering projects was specified in only 16% of those specifications. This type of spec analysis can also show manufacturers how often their brand is specified as the “basis of design” and if it has shifted over a specific period of time. Consider the following chart. What that means for a textile wall finish manufacturer is the market is constantly changing. It is, therefore, important to monitor where your brand stands in the specification path. Certainly, there is room for growth and the opportunity to reach architects is an open market. However, you can have a more profound effect on that market when you become the basis of design. The same research can be done on the other product categories or on specific brands conducted in the AIM Architects’ Brand Preference Study. Let us know where your interests are. Thank you for reading our report.